Discussion in 'Chainsaw Stickies' started by Four Paws, Nov 7, 2008. Looking for a muffler for an 028 Stihl. This is a two piece muffler, the inner piece is still on the saw, so I can get by with just the outer section of the muffler if that's all you have. Doe anyone know what all mufflers will work on the 028? Thanks. I don't remember if the front covers interchange but I was thinking the oldest 028's took 1 more screw that went on the inside part so there is 2 different muffler styles. I might have 1, will try to remember to look. Ok, thanks, Brushwacker. As far as I can see there are two screw holes in the outboard bottom of the inner section of the muffler. I'll look again, check the DoM, and take a pic of it. To me looks like either cover will work regardless the inner muffler. Going to do some chores outside soon, aiming to check for the cover afterward. Without looking at the saw again, I'm almost positive that the holes on this one have threads. 2 different 028 mufflers here. 1 has 2 outer pieces, the other 1. I think the 3 piece 1 has the threads. Mine has rust that would best be cleaned off then repainted. The cover on the 2 piece has the ear broke off where a screw goes through. I reckon it can be improvised and used. Looking for a complete muffler for a Homelite C51. A-59652. Maybe Im just getting old but the little chimney mufflers are way to loud now. I pulled the saw back out. The threads that hold the outer shell on are in the actual saw case, not the sheet metal muffler housing. I'm looking for a chain breaker and spinner. Please PM me if anyone's got one trade. Thanks! 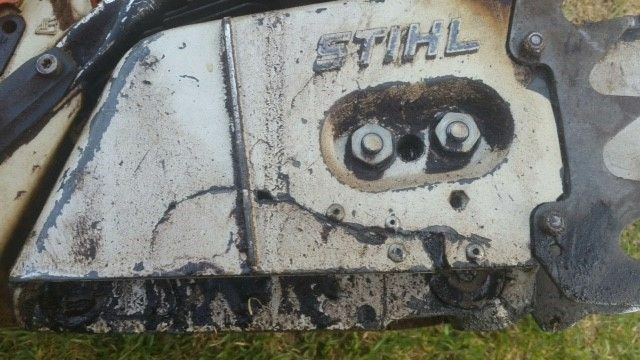 Looking for a replacement chain bar socket side cover for Stihl 084 if anyone has one they are willing to part with, or knows of a source to obtain one please? This one the saw came with is badly cracked and been bodged up for a repair with pop rivets & a small sheet of tin plate behind etc. Not sure how safe it would be in the event of a broken chain. Happy to pay for part and postage to downunder. Can also do Paypal. I have a never used 20" Oregon pro lite bar for a large husqvarna, I believe that's a D009. It's 3/8 .50ga. I'd like to trade for a decent 20" with the medium (346/55,etc) husqvarna mount, I'm not sure what bar mount that is. I'd prefer 3/8 .50 if that's an option. I have 2, .058 .325 bars new in that mount. If 1 of them might trip your trigger, let me know. I wouldn't mind trading both off for something I could use as far as that goes. I use primarily Stihls, several models. Guys I am looking for a PTO side crankcase half for a ms660.... if you guys know someone who may have one please let me know!!!!! I need a tank/handle for a 046. I know this may be difficult to find, maybe someone here can help me out. Have a super clean 262 i'm fixing. Those are hard to come by. I have been promised one of those on several occassions and have yet to see one hit my door. It is easier to just replace the tank with one that does not have that compartment. I have black ones, the gray ones were not 100% fuel proof and would swell. Channel locks were a must then. If you want a black one, pm me your addy. Looking for a clutch cover for a Poulan 3400, 3700, 3800, or 4000. Any colour just want to be able to use a good saw.